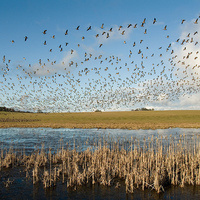 Twice a year, billions of birds migrate thousands of miles in rhythm with the seasons. How do they know when to start migrating? How far can individual birds travel? Join Michael Murphy as he describes how modern technology is catching up with bird migration and helping us understand the forces behind these incredible journeys. In celebration of Charles Darwin’s birthday, the Museum of Natural and Cultural History invites you to its annual conversation series exploring species, ecosystems, and conservation. This year’s theme is “Taking Flight.” All Conversations are free and open to the public.